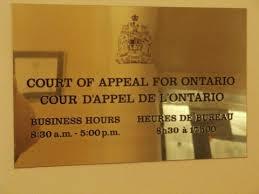 It had been a long time, but I recently appeared in the Court of Appeal for Ontario. The appeal was from a 23 day trial on a hard fought, acrimonious oppression remedy case heard by Mr. Justice Gans. I was not counsel at trial so had the massive task of reviewing 17 volumes of trial transcript to prepare the factum and prepare for the oral argument of the appeal. I’m happy to say my efforts were not in vain: The appeal brought by the other side was dismissed and part of the cross-appeal brought by my clients was allowed.